More debt. Markets are addicted to more debt right now. It doesn’t matter how much they already have. Corporations that are morbidly obese after gorging themselves on ZIRP debt continue to pack it on at every opportunity. And why not? It’s very easy to justify adding unlimited debt when it costs you almost nothing in interest. If you can achieve any return on capital at all, more debt = higher profits. This is what the Fed has wrought. This is what happens when you let the kids eat cookies for breakfast, lunch, and dinner for 10 years. The markets are potentially on a collision course for disaster. The collision course is being brought about by strong fiscal stimulus in the late stage of the business cycle, when conventional economic wisdom mandates that it should be heading the other direction to create fiscal drag. The U.S. economy is beyond full employment. The labor market is beginning to reach capacity constraints in a number of areas, which is resulting in a pickup in wage pressures. At this stage of the business cycle monetary and fiscal policy would normally be utilized to cool off the economy, but with the huge fiscal stimulus coming online, the Federal Open Market Committee (FOMC) will feel obliged to play the role of creating economic headwinds. By the time we get to the end of 2019, when the overnight rate is between 3.25–3.5 percent, corporate America will be in worse shape than it is today. It will be in worse shape than it was last year. It will be in worse shape than in 2007. 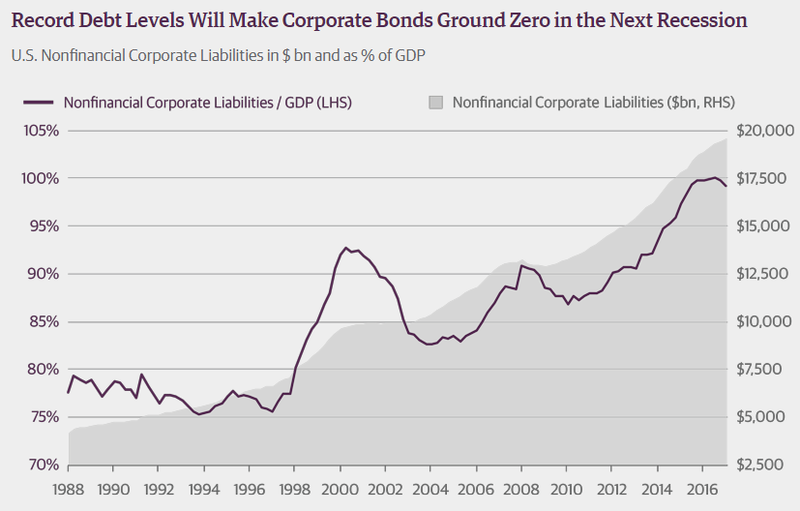 We will enter the next recession with the highest debt load on record for corporate balance sheets. In the last recession, consumption by households collapsed because their balance sheets were overburdened by debt, and it was the household sector that led us into the recession. The next recession is going to emanate from the corporate sector. There is likely to be a sharp decline in employment and a sharp decline in profitability, followed by widening credit spreads as the market discounts the expectation of higher corporate defaults.